last information on Stormbringer Remastered from DPAS said it will come in August. Does anyone know more about the release date? Not sure when it's due, but what with Live in London getting pushed back and only now getting a release, it's no doubt delayed due to that. I would imagine it'll be out before Christmas, barring any unforeseen circumstances. Shoot an email to dpas - I'm sure they'll give you an update, as it is currently available for pre-order. Ann from dpas has no other information than we! Thanks for the update Michael, be sure and let us know if you hear anything further. Stormbringer has gone back to Spring 2008. Work on the upgraded Stormbringer began in October 2006. It will include remastering of the original album master tape, and the usual bonus items taken from the multi-tracks, with remixes by Glenn Hughes and tracks from the quad edition. Extensive booklet. We are expecting a Spring 2008 release. Thanks for the update, Paul! Really looking forward to it! spring 2008 ?? hope it will be ok this time !! According to the Deep Purple Appreciation Society, it looks like the wheels are turning again on the DEEP PURPLE "Stormbringer" remaster. The album, which was originally issued in November 1974, will be re-released as a double-CD set, with CD1 featuring the original album remastered plus the new mixes by Glenn Hughes and Pete Mew. CD2 will contain the original quad mixes in 4.1 and stereo. The set is likely to come out in a special edition, which Simon Robinson from the Deep Purple Appreciation Society has been asked to put together. "I'm going for a CD-size hardback book format, with extras including accurate reproductions of the American in-store advertising card and other goodies," Simon says. No firm release date has been confirmed yet. That's good to hear, because for a short while it was looking like the remaster might have been shelved. And that would have been a pity, as they're so close to wrapping up the 70's era of the band. Fantastic news Jon thank you for that! That's on my list of purchases for sure. In fact I'd love to hear Glenn do Holy Man as an acoustic number within his full band set. He already does it in the acoustic set. Anyway back to Stormbringer remaster. Yep look like Simon's giving it a worthy treatment. Bring it on! Good news, indeed - I was probably as afraid as Arjen was! Stormbringer somehow always seems to disappear between the mighty Burn and Come Taste The Band - probably 'cause Blackmore has never been fond of it!? A few more reels of 16 track masters have just surfaced and EMI are looking at the possibility of getting listening copies to see if these yield anything more than the tapes which Glenn did the remixes from. So a little while longer to wait me thinks.....no problem, I'd rather wait until everything is found, to lay down the best possible remaster. Yes, been waiting a long time for this one, "Stormbringer" is a great album!! Lets hope it's a good remaster, not all are improvements on the originals, take "Rainbow Rising" for example, the remaster is worse. "Burn" however was great, so fingers crossed! Hopefully there will be remastered vinyl edition also. My old copy has worn out! The wheels are turning again on the Stormbringer remaster. There will be a 2xCD limited slipcase edition with original quad 4.1 mixes and other goodies, including Glenn's excellent remix work, video elements and more. There is a double gatefold vinyl edition planned, also limited. These are available to pre-order from dpas mailorder (anyone who ordered before this was posted will automatically be shipped the 2xCD edition). Once the LE 2CD has gone, the title will be issued as a lower priced 1xCD regular edition with the album, remixes and a few other items. It looks like the old CD version is being deleted so if you prefer the softer CD transfer, and haven't got this, best order sharpish. Glenn has contributed some text for the booklet, and a super big transparency of the original sleeve painting has been unearthed in America to use on the reworked sleeve. Have a look for the latest update on Stormbringer Remaster at the DPAS website!!! 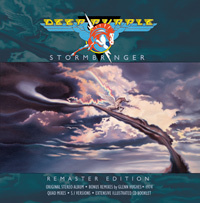 Major reissue plans for Deep Purple's Stormbringer. Deep Purple's classic 1974 album Stormbringer is to get the full-on reissue treatment in January 2009 (release date to be confirmed). Stormbringer, the second and final studio album from the MK III line-up of the Purps, features Ritchie Blackmore on guitar, David Coverdale on vocals, Glenn Hughes on bass, Jon Lord on keyboards and Ian Paice on drums. Original album Quadrophonic mix 5.1 DTS 96/24 and original album Quadrophonic mix stereo 48/24 with on screen images. NTSC region 0. Only previously available on Quad vinyl in the US. The Quad mix has been tweaked to be a 5.1 rather than 4.0 mix, has been completely remastered and this is its physical digital debut. Bonus clip: Stormbringer from German TV. Rare and only TV performance of a Stormbringer track. interesting that the remixes are longer - Love Dont Mean a Thing is nearly a minute more. Conrad's Sig: For ever learning. Awesome. It's been a long wait. And truly something to look forward to for the start of a new year. Which brings us to Come Taste the Band. Hmm... Another 5 or so years? Does anybody know about the video footage of stormbringer? I hope it is not teh ****ty quality that is circulating on youtube. Glenn has contributed some text for the booklet, and a super big transparency of the original sleeve painting has been unearthed in America to use on the reworked sleeve. Official European release date for Stormbringer is January 19th, 2009. I know that these DP reissues are not known for being done quickly...the understatement of the century...but I do believe that this one will be worth every second of the wait. And Glenn's active participation makes it that much sweeter! Hang on ladies and gentlemen...it will be here before you know it!